Tens of thousands of Ukrainians bearing EU flags and chanting "Down with the gang!" marched through Kyiv yesterday (24 November) in a pro-Europe rally denouncing President Viktor Yanukovich's U-turn in the country's European policy. In the biggest street demonstrations in Kyiv since the Orange Revolution nine years ago, opposition leaders called on Yanukovich to go ahead with the signing of a landmark agreement with the European Union on 29 November in Vilnius as originally planned. Prime Minister Mykola Azarov, who stunned European leaders on 21 November by suspending preparations for a landmark pact with the EU after years of negotiations, should step down, they said. According to the opposition, 100,000 people took to the streets of Kyiv. The authorities put their number at 20,000. A pro-government counter protest reportedly gathered 10,000 people. Kyiv police fired tear gas after protesters threw a smoke grenade at officers in an attempt to break into the Cabinet of Ministers building. Opposition parties adopted a declaration which called “national treason” the decision by the government of Azarov to put EU association on hold. It also said that the parliament should resign following its inability to pass a bill allowing for former Prime Minister Yulia Tymoshenko to leave jail for treatment abroad. Opposition parties called on Yanukovich to reverse Azarov’s decision, to free Tymoshenko and sign the EU-Ukraine association agreement (AA) at the Vilnius summit. In case of non-compliance, the opposition says it would take the course towards his impeachment and called on all democratic countries in the world to take “personal sanctions against Yanukovich and his corrupt regime”. In the meantime, the authorities announced that Yanukovich had not changed plans to attend the Eastern partnership summit in Vilnius. “Despite the suspension of preparations to sign the Association Agreement, the visit of Yanukovich to Vilnius hasn’t lost purpose,” the website Zerkalo Nedeli quotes a counsellor to the president as saying. In the meantime, Arseny Yatsenyuk, leader of the Batkivschchyna party of former Prime Minister Yulia Tymoshenko, said that Yanukovich was no longer welcome in Vilnius, and that instead of the president, three leaders of the opposition would attend: Vitali Klitschko, leader of UDAR, Oleh Tiahnybok, leader of Svoboda, and himself. Yatsenyuk, a fierce critic of Yanukovich, has accused him of having traded Ukraine’s EU future against guarantees from Russia concerning his re-election in 2015, lower gas prices and $20 billion. Meanwhile, Reuters quoted Enlargement and Neighbourhood Commissioner Štefan Füle as saying that the EU had not given hope that Ukraine would sign the AA in Vilnius. “No, we have not fully given up as we were not actually officially informed by the Ukrainian side that the signature is impossible at Vilnius,” Füle said on Friday. He added that if the pact is not signed there, he hoped that it could be signed at an EU-Ukraine summit next year. 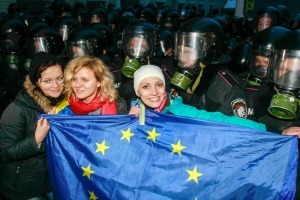 But sources in Ukraine told EURACTIV that pro-European Ukrainians were disappointed by what they saw as the lack of Western public interest in their country’s future. Indeed, the mainstream media in all large EU countries, except Poland, have paid little attention to the latest developments concerning Ukraine. Merkel said on Saturday that she would speak to Russian President Vladimir Putin about Ukraine. She added that the association agreements which the EU plans with three countries of the Eastern partnership are not directed against Russian interests. The Russian press writes that the reason for Ukraine’s U-turn in EU relations was that Brussels had failed to assure Kyiv that it would receive help if Russia would close its borders to Ukrainian goods and restrict bilateral trade. The website of the Russian TV Novosti writes that Ukraine warned of losses stemming from Russia’s obstructions to the amount of $8 billion (€5.9 billion). To this, the EU offered €1 billion, an amount which has been qualified as “ridiculous” by Polish MEP Pawe? Zalewski. Another demand that reportedly scared off Ukraine from rushing to the EU concerns gas prices for domestic consumers. The International Monetary Fund (IMF) recently imposed a demand to drastically increase the gas bills of Ukrainians while freezing the salaries at the current level and doing additional budget cuts – something which Prime Minister Azarov had reportedly called “the last straw” in EU talks. Commission President José Manuel Barroso and the Council President Herman Van Rompuy published today (24 November) the following statement concerning the Ukrainian decision to suspend temporarily the preparations for signing the AA. “The offer of signing an unprecedented Association Agreement and a Deep and Comprehensive Free Trade Area (DCFTA) is still on the table. This requires the necessary political will by the Ukrainian leadership, determined action and tangible progress on the conditions set out in December 2012. Important progress has already been achieved by Ukraine. We are convinced that signing the Association Agreement and a DCFTA, the most ambitious agreement the European Union has ever offered, provides the best possible support for Ukraine's economic situation, reform course and modernisation in view of building a prosperous and stable future for all Ukrainians. The EU stands ready to be more open and more supportive to those who are willing to engage in reforms and modernisation. “While being aware of the external pressure that Ukraine is experiencing, we believe that short term considerations should not override the long term benefits that this partnership would bring. However the European Union will not force Ukraine, or any other partner, to choose between the European Union or any other regional entity. It is up to Ukraine to freely decide what kind of engagement they seek with the European Union. Ukrainian citizens have again shown these last days that they fully understand and embrace the historic nature of the European association. “We therefore strongly disapprove of the Russian position and actions in this respect. The Association Agreement and a DCFTA are opportunities to accompany our common neighbours towards modern, prosperous and rule-based democracies. Stronger relations with the European Union do not come at the expense of relations between our Eastern partners and their other neighbours, such as Russia. The Eastern Partnership is conceived as a win-win where we all stand to gain. The European Union continues to stand ready to clarify to the Russian Federation the mutual beneficial impact of increased trade and exchanges with our neighbours, whilst fully respecting the sovereignty and independence of our Eastern Partners and the bilateral nature of Association Agreement and DCFTAs. “The European Union looks forward to the Eastern Partnership Summit in Vilnius this week. It will be an important moment to take stock of the situation and take forward the relations with our Eastern partners." The Ukrainian government announced on 21 November that it had decided to stop its preparations to sign an association agreement with the EU. The statement made clear that the decision was taken with a view to elaborating measures towards “Russia and other countries from the Community of Independent States”. Also, Kyiv will “resume an active dialogue with the Russian Federation and other countries of the Customs Union and the member states of the CIS on the revival of trade and economic relations in order to preserve and strengthen joint efforts of economic potential”. The statement does not say whether Ukraine intends to join the Customs Union led by its former Soviet master Russia, which the EU says is incompatible the statute for countries associated with the Western bloc. Ukrainskaya Pravda: ? ?????? ????? ??? ????????? ????? 100 ????? ?????? ?, ??????? ????? ? ?????? Zerkalo Nedeli: ?????????? ?????????? ?????????? ???????????? ???? ??? ???????? ?????????????????? ??????? Whilst the people of Ukraine are demonstrating that they want to join the European Union, in the UK some people are protesting that they want to leave. If the UK does divorce from the EU, it will be the first time a member state has ever left. Will the EU become a revolving door: Ukraine in, UK out? The Conservative party has promised an EU in-out referendum in four years time if it wins the next General Election. But according to the latest opinion polls, Britain is evenly split on this issue, with about a 40% wanting to keep its membership of the EU, and about 40% wanting to quit. Why is there a queue of countries that want to join the European Union, but so many people in the UK apparently want to exit? This weekend US academic, Dr Ted Bromund, argued in the Yorkshire Post that EU immigration puts a strain on the country’s social structure, and the EU threatens Britain’s sovereignty. Please sign and share, blog, tweet, facebook the Daily Express petition to stop EU immigration. Over 150,000 have signed. Alexander Strong, the people of Ukraine don’t believe your rhetoric; they are voting with their feet, towards the European Union. I also don’t believe you. I was at the 1975 referendum and I remember the NO campaign literature very well. I remember it particularly well, because I voted NO. Now, I realise that all the hype about Britain being ruled by a foreign power (the same hype as today, nothing has changed) was not true. The European Union is a democracy, with democratic power being increasingly devolved to its European Parliament, and I believe this process will continue. My vote is for the European Union, and long may it prosper. Yes, there’s a lot wrong, but I want us to stay on board so we can help to fix it. I invite Ukrainians to read my article, ‘The value of being citizens of Europe’. And I hope that eventually we will be able to include Ukraine in our European community. Tens of thousands of Ukrainians bearing EU flags and chanting “Down with the gang! I love it, how proudly they rise the European Flag! Again here !! People in UKR seems very pro Europeans indeed! Their “government” should retake the full joining of UKR into EU in consideration! Ukranian’s people shouldn’t give up for instance and continue their more biggest street demonstrations in Kyiv! !